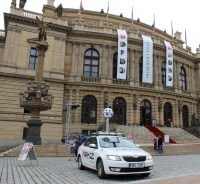 TopGis is a Czech company operating mainly within Europe, with a focus on aerial imaging, photogrammetry, mobile mapping, and various other geographic information systems (GIS). Operating in a competitive market, the company needs to deliver the highest quality data quickly, efficiently and at the lowest possible cost. In order to do this, TopGis selected cameras from international vision company, JAI. Within the Czech Republic, one of TopGis’ largest partners is Seznam.cz, a company that operates a range of services, including a web portal, search engine and web mapping portal similar to those of Google. One aspect of TopGis’ role in the partnership is to handle all the geographic data gathering and processing for Seznam, and essentially participate in the commercialisation of geomatics to its full potential. In addition to providing standard aerial imaging for use in photo maps, TopGis extended its services to oblique aerial imaging of cities, and decided to build a mobile mapping car in order to generate data from the ground. In principle, these cars are similar to the ones used in the creation of Google Street View. In 2013, TopGis designed its first system using a variety of the latest cameras available on the market at that time. According to Plšek, the cameras all used CCD (charge-coupled device) chips, which proved slightly insufficient when producing images in high levels of light – images taken in the direction of the sun, for example. The limits of the technology represented a real challenge for the company, as Plšek explained: ‘The parameters we’re dealing with are very complex. On the one hand there are systems that combine panoramic cameras with laser scanners in order to provide accurate and precise positioning data for geographic information systems. This is specifically for mapping purposes and although effective, the quality and resolution of the panoramas being produced by those systems is very low. 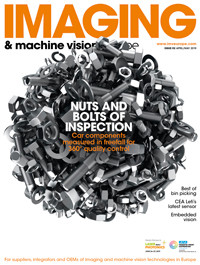 The other factor is cost as not only is laser scanning quite expensive, but the cost of processing that data is higher than many of our customers would be willing to pay. ‘Then there are mobile units like the car/camera set-up used for Google Street View, and that’s a completely different world,’ he continued. ‘Google has its own system and despite the position and orientation information being gathered via global positioning systems (GPS) and inertial measurement units (IMU), the main focus is the generation of images for viewing purposes only. A high level of detail is gathered but it’s mainly used for positioning within a scene. ‘The challenge we faced was how to combine those two types of systems so that we have very precise information about the orientation of space, together with high resolution photographic images. It’s about utilising the benefits of both systems in order to deliver accurate and detailed panoramic images that can be used for both mapping and viewing,’ added Plšek. TopGis is currently finalising the second version of its mobile mapping system, which comprises a car containing 18 separate cameras. In order to create competitive and accurate panoramas, navigation, positioning and image triggering were all important factors that needed consideration, but the most critical was image resolution. For this reason, TopGis began looking for cameras with 1-inch CMOS chips. Plšek added that the high resolution afforded by the cameras was the determining factor because the better the image quality, the happier their customers. The decision to use JAI’s cameras also has economic benefits for TopGis as the legibility of details such as the names on street signs and the numbers on building plates has a significant impact when addresses are being mapped from images. If the mobile mapping car were to use low resolution cameras and then journey down a wide street, for example, it would most likely need to pass the buildings twice; once in one direction and then again in the opposite direction. With higher resolution cameras the cost of mapping decreases as the car only needs to travel once down a street.